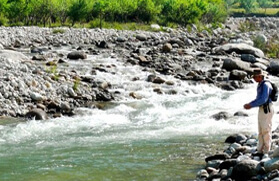 Kali River originates in the Pithoragarh District, Uttarakhand. This radiant river forms a natural eastern boundary between India and Nepal. Named after Goddess Kali, this river descends in the plains and runs into Saryu River and it is known as Sharda. Kali River is a torrential river, which is, because of its secluded location, counted among the best Mahaseer fishing spots in India. Kali River in Pancheshwar is an abode to renowned Mahaseer fishes and guarantees unsurpassed opportunities to the lovers of fishing. 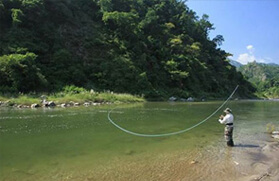 Enhancing the delight of fishing enthusiasts, the landscape formed by the river fascinates the tourists in no time. 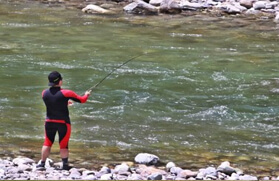 Rivers and lakes of Uttarakhand are brimming with fishes and the game of angling is allowed in Ghat of Saryu River and Kali Rivers in Pancheshwar. Pancheshwar is located 33 kilometres from Lohaghat and forms the border with Nepal. The place is famous for the temple of Chaumu. To enjoy a comprehensive and recreational tour of angling in Kali River, this 05 Nights and 06 Days itinerary is simply perfect. You, as a fishing aficionado, can soak yourself in the cherished moments of fishing and angling. It is a sheer and incomparable excitement to enjoy fishing in Kali River with having the serenity and natural marvels frittered all around you. Note: One cannot take the Mahaseer Fish with him or her as it is mandatory to leave the fish in water after catching it. On the first day of our tour we will depart from Delhi at 5 am and drive to Pancheswar, which is about 12 hrs journey by car. On reaching Pancheswar, you will be welcome by our local guides who will show you our campsite. Thereafter, enjoy dinner and an overnight stay in the camp. On the first day of our angling tour after breakfast in the camp, we will head to the meeting point of Kali and Saryu Rivers. 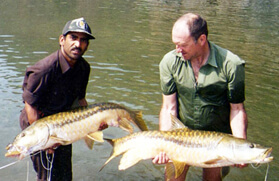 Here, we will fish for Mahaseer, a big mouth golden fish closely related to European Bardel and Carp. At this particular location, the record Mahaseer taken is 80lbs. After enjoying angling here for a complete day, we will return back to the camp for dinner followed by an overnight stay. On the second day of our tour, we will start our day quite early and leave for an early morning fishing experience. Afterwards, we will return back to the camp and have morning breakfast before proceed to our next mission i.e. rafting in Surnia River. It is a small stream that is coming in India from Nepal and has a wonderful camp-site offering an amazing camping experience near the River with fresh water. Stay overnight at Surnia junction and have a lifetime rafting and camping experience. Today after a light breakfast in the morning, we will proceed for another interesting rafting experience. With the help of professional rafters, we will raft till Ladiya River's confluence and pass throw many tough, easy and challenging paths. After completing the rafting, enjoy dinner followed by a relaxing overnight stay in the camp. In the morning after delicious breakfast serve at the camp, we will leave for rafting, which will cross Chuka rapids (Grade 3-45 depending on the water level) in first half and in next half, it will sail through Purnagiri Gorge. Today rafting journey will surely going to add on to your adventure passion and leave you with many lifetime memories. Take pleasure of an overnight stay in the camp. On the last day of our, we will have our breakfast in the morning and thereafter, leave for Delhi, which is about 430 kms away from our set camp location. On reaching Delhi, we will leave you at your preferred location with a final goodbye note. Special Note: The golden MAHSEER is an endangered species because of poisoning/bombing by wasted commercial in the river or out of control poaching of the river by the locals. Further, we don't make any promise of catch. 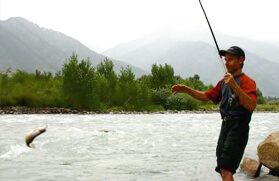 Although, catching a strong golden MAHSEER is an ultimate lifetime experience for every angler. Rest, we ensure that this tour can help you in witnessing the beautiful Flora and Fauna on the natural stretch of river will just be an enjoyment for the travellers.